DPRK satellite fueled up for launch - video door phones,intercom system,video door phone,modules.CCTV. 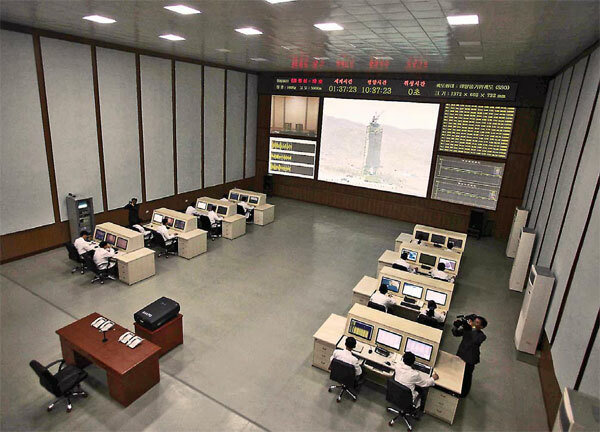 [align=left]The control room of the Democratic People's Republic of Korea's satellite launch center is shown to foreign journalists on Wednesday. Pyongyang said fuel has been injected into a satellite-carrying rocket and that everything is set for launch. [align=left][align=left]The control room of the Democratic People's Republic of Korea's satellite launch center is shown to foreign journalists on Wednesday. Pyongyang said fuel has been injected into a satellite-carrying rocket and that everything is set for launch. Pyongyang on Wednesday was injecting fuel into a rocket it plans to send into space with an observation satellite onboard, according to a China Daily journalist invited to watch the approaching launch. "The satellite has been completely assembled on the launch vehicle. We're injecting fuel," Paek Chung-hou, general director of the General Satellite Control Center of the Democratic People's Republic of Korea, told reporters. The DPRK government on Wednesday invited a group of foreign visitors to the launch site, which lies about 20 kilometers northwest of Pyongyang. When asked if the DPRK would launch the satellite on Thursday, the director said "the exact date will be decided by my superiors". Experts have said it will take nine to 10 hours to inject fuel into the rocket, which means it could be launched as early on Thursday and no later than Monday if Pyongyang's plans are carried out. Paek said that, even though he is busy preparing for the launch, DPRK top leader Kim Jong-un ordered him to participate in interviews with the media. "This is unprecedented and is meant to show the transparency of the launch," he said, adding "it's necessary that we share data (from the launch) with other countries." "As you can see here, you can tell this is a satellite and not a missile, which would have a warhead," Paek said. He said Washington's insistence that Pyongyang is launching a missile stems from its decades of misunderstanding and hostility toward the East Asian country. Paek, though, said people in the DPRK "don't really care about outside opinion". "It (the launch) is critical to the development of our economy, and that is why we are going ahead." "The Americans make us very puzzled," he said. "They will exaggerate the threat and military power of the DPRK when they need a larger military budget." Four busloads of visitors, including a China Daily reporter, were escorted to a two-story mission control building in the heavily guarded compound in Pyongyang's northern suburbs. Inside were 16 white-coated technicians, both men and women, working on computers and monitoring screens that will show the temperature of the satellite, its orbit and other data. Paek said some of the technicians had worked on the DPRK's two previous rocket launches. A main screen in front of them showed what official guides said was a live image of the 30-meter rocket on its launchpad. The device was shrouded at the top to protect its satellite payload. Also invited on the trip were foreign space experts. They said the mission-control equipment appeared dated compared with what is used in the West or Russia. Paek said the computer hardware and software were developed in the DPRK. James Oberg, an NBC News space consultant and one of the world's leading interpreters of space exploration, said, "I believe this is not a military shot". Yu Shaohua, director of the Department for Asia-Pacific Security and Cooperation Studies of the China Institute of International Studies, said Pyongyang's invitation to so many foreign experts and media and an early announcement of the launch plan shows that it "cares about the reaction of the international community very much". Xinhua and AFP contributed to this story.